A decision by Chinese officials earlier this year is hitting curbsides in Keizer and throughout the United States now. In March, China enacted “National Sword 2017.” The action imposes severe restrictions on the import of recyclable low-grade plastics and unsorted paper. Until this year, China was the primary market for getting rid of these specific materials picked up at curbsides nationwide and especially on the West Coast. However, contamination of the materials being sent to China has led to a crackdown in a effort to clean up the Chinese environment and to avoid being labeled as the world’s landfill. 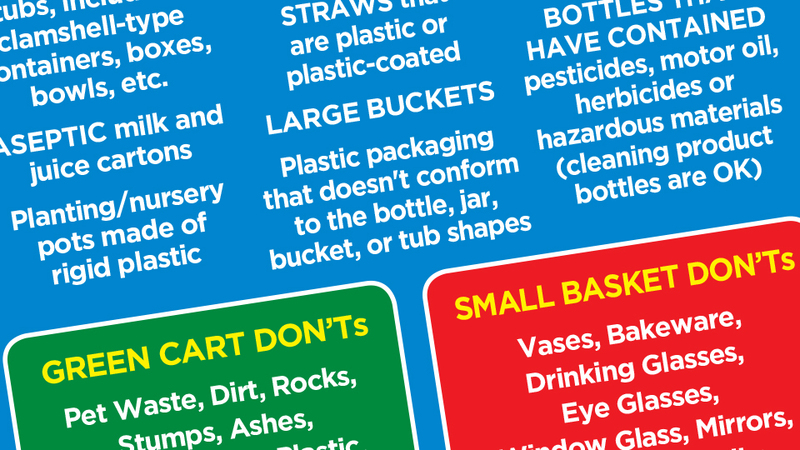 Contamination of the material generally happens at home when families throw away low-grade items like bibs, mattress covers, ice cream and yogurt containers, drinking straws, syrup bottles, meat trays, opaque spoons and cups, 3-5 gallon water containers, bottles and sippy cups without rinsing them first. Contamination of the material has led China to reject shipments sent overseas and is now causing a backlog stateside, locally it is occurring at sorting facilities like Garten Services and Pioneer Recycling in Portland. “Working with our two processors, we have capacity through November. It will be day-by-day and week-by-week in December. Beyond that it’s unclear,” Lear said. The West Coast states have led the nation in recycling for decades, but changes in what China is willing to accept will have a dramatic effect in shaping the future of such efforts. When area residents haul out full blue containers to the curb every other week, the contents disappear by the end of the day and, typically, not much thought is given to it beyond the sense of having done something positive for the planet. But that’s really just the beginning of the journey for the 2,000 tons of recyclable material Marion County residents produce every month, said John Sullivan, general manager of Loren’s Sanitation. Portions of the co-mingled mixed recycling go to Garten Services for sorting, the other part goes to Covanta in Brooks, a publicly-held waste-burning plant that converts 550 tons of solid waste into 13.1 megawatts of energy on a daily basis. At both sites, the mix is sifted through for items that can be resold into local markets. These include high-grade items like water and soda bottles, cooking oil containers, peanut butter containers, milk jugs, juice bottles and detergent and hair care bottles. Whatever is left at Covanta is put on a truck and taken to Pioneer in Portland. At Pioneer, the mix goes into a screen that filters out the largest pieces and sends the rest through a processing line that ends with human workers separating out the jumble into specific types of recyclable materials. Two of the piles are low-grade plastic and unsorted paper. For decades, the manufacturing economy in China has been willing to take those piles of materials and extract the pieces that can still be used to make items like boxes, paper, clothing and other items. This worked well for the West Coast with ports lining the Pacific Ocean and accepting an ever-increasing number of products from Chinese manufacturers. Containers that were sent to the U.S. with cell phones, were packed with recyclable material before they went back. The onset of comingled recycling has allowed U.S. residents to become more complacent about what they place in the blue containers and it’s led to more contamination. That’s meant China has had to deal with the pollution and costs of getting rid of the contaminated material while the U.S. has enjoyed most of the benefits. In 2013, Chinese officials enacted more aggressive inspections of the material, the National Sword is the next step in cutting losses. In addition to refusing some shipments, China is enacting tougher limits on contamination (no more than .03 percent) and it has stopped renewing buyer licenses for those who purchase recyclable material on China’s behalf. The .03 percent standard is set to take effect in January 2018 if nothing changes, and it will be virtually impossible to meet, said Lear. “At the best sorting mills in America, contamination is 1.5 percent. Even with a pure newspaper sort, the best they ever got to was 1 percent,” Lear said. Sorting facilities have slowed their lines in an effort to reduce contamination, but doing so adds to the backlog already underway. Lear said Pioneer is experimenting with adding more human workers to the line, but .03 percent contamination is still a stretch. Lear said he isn’t certain China will make good on it’s threat of the .03 percent, but everyone in the industry is planning for it to happen. The biggest thing residents can do to help is simply rinse their recycling materials before putting them in the blue containers, said Greg Dittman of Valley Recycling & Disposal. “Comingled recycling is successful, it’s just that the materials causing contamination and those were tolerated for a while. The ones we don’t get out cause the problem,” Dittman said. In some ways, comingled recycling has become a victim of its own success. “Our rate structure is built so that people try to get down the smallest cart size and everything else goes in the recycle bin,” Lear said. Sullivan added that sanitation companies have invested heavily in the technology to make it possible and doesn’t see a return to resident-separated programs in the future. The problem is in the lack of local markets for the items being shipped to China. “We’ve seen paper mills close because they are not something we want in our own backyard,” Sullivan said. It is also becoming more important to heed the fine print on the types of items that can be recycled. Plastic films, plastic bags, diapers and other items not only cause greater contamination, they can halt the sorting machines that keep the lines moving. “The plastic films wrap around the chains that operate the machines and the whole line is stopped while they are cut away,” Sullivan said. There are also some more egregious violations that slow or interrupt processing. Loren’s Sanitation hosts an unmanned recycling drop and some of the items they’ve pulled out of the bin boggle the mind. Car seats, seat belts, blue tarp, shelves, plastic bins linoleum shoes, rollerblades and a Shop Vac are just a few in recent months. On the national level, some larger corporations are also stepping up to demand post-consumer plastic in the shipping materials to juice the stateside market for the material China is refusing. The Oregon Department of Environmental Quality is also working on an agreement with cities to allow the leftover material to be burned or landfilled if a crisis occurs. If that ends up happening, sanitation companies might be approaching cities for rate hikes sooner rather than later because it will increase the tipping fees paid at sites like Covanta and the Coffin Hill landfill near Corvallis. Another option is barring certain materials from the comingled mix. However, if that happens, Lear said it’s in everyone’s best interest to stay on the same page within Marion County. “If we have certain cities barring the items and other ones still want them accepted, then we have even bigger problems,” Lear said. Until then, everyone is in wait-and-see mode until Jan. 1, 2018.